Toshiba Electronic Devices & Storage Corporation (“Toshiba”) today announced six new series of internal hard drives for the consumer market: P300 Desktop PC Hard Drives, L200 Laptop PC Hard Drives, X300 Performance Hard Drives, N300 NAS Hard Drives, V300 Video Streaming Hard Drives, and S300 Surveillance Hard Drives. The P300 Desktop PC Hard Drive series offers high performance ideal for home and business users and is available with up to 3TB  of storage capacity. They operate at 7,200rpm and have built-in shock sensors that detect impacts and reduce vibration during read and write operations, improving tracking accuracy and performance. The L200 Laptop PC Hard Drive series delivers up to 2TB capacity in 2.5-inch  mobile drives and delivers better shock and vibration resistance than 3.5-inch hard drives and works with every major brand of laptop computer. They are also suited for use as external storage. The L200 line-up has a lower power profile than 3.5-inch hard drives, to help optimize the device’s battery life. All models have a built-in shock sensor and ramp loading technology to support reliability. The X300 Performance Hard Drive series offers up to 10TB capacity and features Toshiba’s cache technology, optimizing cache allocation during read/write to provide high-level real-time performance. Available in a 3.5-inch form factor, the X300 drives operate at 7,200rpm and have a cache memory of up to 256MB. The series delivers extreme performance and robust capacity for creative and professional applications including graphic design, animation, photo and video editing, and PC gaming. The N300 NAS Hard Drive series, for personal, home office and small business network attached storage (NAS) applications, is available in capacities of up to 10TB, and features 7,200rpm and a large 256MB data buffer in 10TB model. N300 is highly scalable, able to support up to eight drive bays in a multi-RAID NAS design, and can be configured in NAS by users as their data storage needs evolve. The drives are highly reliable, with a high workload rating of up to 180TB/year; they are optimized for the performance, reliability, endurance and scalability required of NAS environments in which large amounts of data need to be efficiently stored and accessed daily. The V300 Video Streaming Hard Drive series is designed for reliable video recording and playback, and offers built-in silent seek technology, which delivers quiet operation. The V300 energy efficient design reduces energy consumption by up to 25%. Available in up to 3TB capacities, the V300 Hard Drive supports video editing systems, set-top-box (STB), digital video recorders (DVR) and network video recorders (NVR). The S300 Surveillance Hard Drive series offers 24x7 reliability and high performance with a large cache size up to 256MB. S300 drives perform at up to 7,200rpm with a maximum data transfer speed of 248 MB/s, and integrate RV sensors to help suppress vibrations in multi hard drive platforms. Available in capacities of up to 10TB, the new surveillance hard drives can handle high workloads of up to 180TB per year and support surveillance network video recorders (sNVR), surveillance digital video recorders (sDVR), hybrid sDVR (analog and IP) and RAID storage arrays for surveillance. In addition, Toshiba introduces color branding for each category in the consumer internal hard drive line-up. The new category colors will be displayed on the drive labels and retail shelf packaging to clearly communicate category of use and device application. 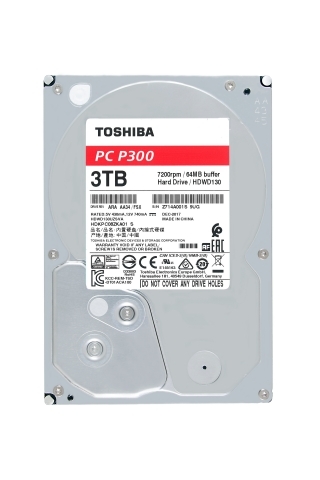 The color labeling for each hard drive is as follows: both P300 and L200 in a red desktop/laptop PC label; X300 in a silver performance label, N300 in a gold NAS label; S300 in a green surveillance label, and the V300 in a blue video streaming label. The consumer friendly, easy-to-identify color coded drive labels and retail shelf packaging will make it easy for consumers to shop for the drive they need. Form Factor: "2.5-inch" means the form factor of Hard Drives. They do not indicate drive's physical size. 25% energy consumption comparison is based on 2TB models of P300 and V300. This specification is for the S300 10TB model.